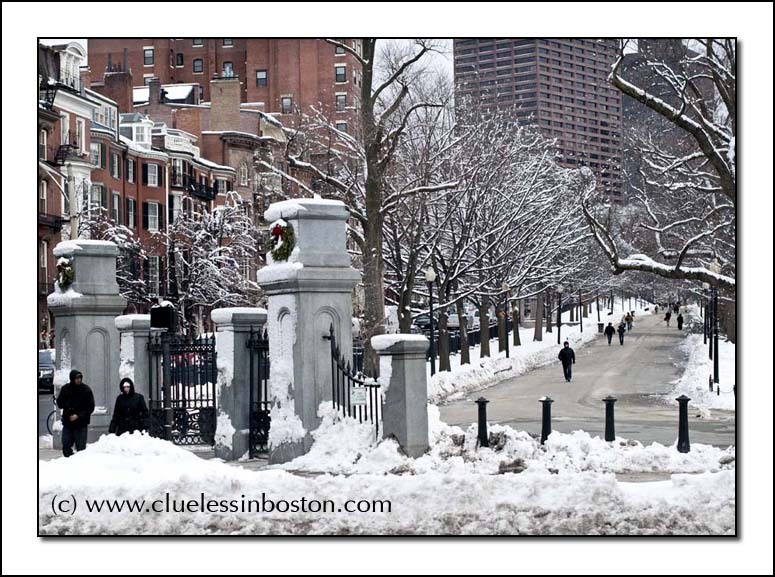 View looking up the Beacon Street Mall of the Boston Common on a snowy day last week. The scene is the same today as we got blanketed by more snow last night and are headed for a deep freeze over the next few days. Here is another photo of the Mall on a March day two years ago, viewed from a different perspective. That photo is sooo "Boston" - I enjoyed a sales conference there a few years ago! Yes, parts of our country are "enjoying" a deep freeze yet it is still possible to appreciate the beauty of a scene such as this one. Stay warm in the deep freeze; our temps are back to freezing, but no snow. The white snow matches very well with the red walls! Postcard perfect photo. All that snow reminds me of wearing two pairs of socks and two pairs of gloves when I lived in Boston! A most attractive photo - but I'm glad we have got rid of all our snow. It looks really deep in Boston. Beautiful view: I like this snow that seems to change every color!